September comes in like a ghost. The sun breaks through a while later but the day is changed, the herald of autumn remembered. 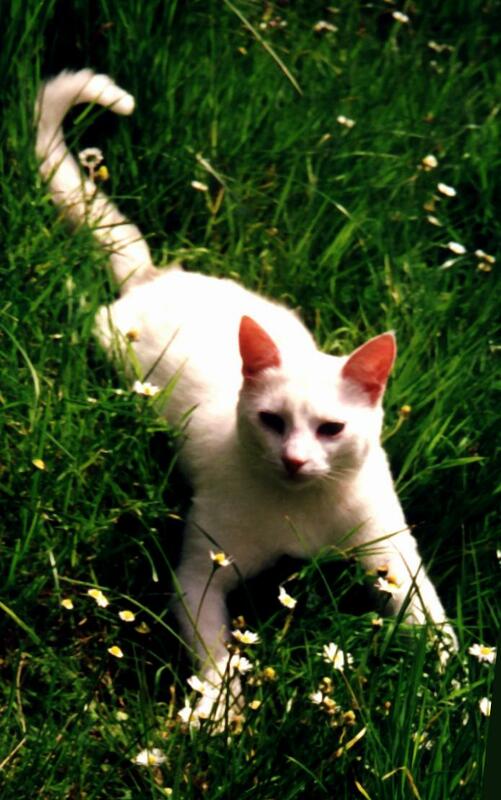 I remember Minou, my white cat with no ears who has recently left this world. His nine years on this earth were a mixed bag of pleasure and pain, but when he arrived in my house, brought as a present from my youngest son, he was an adorable, tiny bundle of fluffy white kitten. Having been without a pet, cat or dog for a long while, I was delighted to have him. He grew into the most affectionate cat I have ever known, becoming almost lecherous in his attention. When I picked him up for a quick cuddle, slowly, snakelike, he made his way towards my neck until I could have worn him like a scarf, nibbling and dribbling all the while; the experience was not at all pleasant. It soon became obvious that he and I were not going to have a relationship of the cat-purring on my lap type that I was used to. He wanted to be much closer than that and I didn’t like it. But he didn’t reserve his amour just for me, he was desperate to be close to anyone that came inside my door until eventually, he was banned from human cuddling. He was allowed to sit on the sofa in the evenings, but that too had to stop, for as soon as my attention was taken by something else, his sly slithering began, towards my lap, shoulders or neck, depending on whether he had been sitting on the arm or back of the sofa. Poor Minou, I could see him cringe as I responded to his ardent attempts with distaste, scolding him and putting him back in his place. By the time he was about six years old, he finally understood that his enthusiastic attention was never going to be reciprocated. I felt sorry for him, and in truth, I also felt guilty. I gave him everything he needed, food, water, a warm home, he had the friendship of my black cat Geronimo and the protection and body heat of Ruairi, my gently Irish Wolfhound, everything except what he really needed, which was simply to be loved, and yet, there was something special about him. He was incredibly loyal and we could ‘see’ each other in a way that is not of the everyday world. I knew him somewhere inside myself where humans and animals are the same, and I know that he knew me too. For some reason, we had been brought together, to learn perhaps from each other, or rather, maybe Minou was in my life to teach me a lesson about love. During his short life, he used up only some of his nine lives. When he was only a couple of years old, he was hit by a car outside our house, the driver didn’t stop. Minou survived the accident with the skilful hands of our vet, his broken leg was mended with the insertion of a tiny pin and he recovered without any apparent ill effects. Melanoma spots appeared on his ear, quite common apparently in white cats but they were becoming a cause for concern. The only option for Minou’s continued life was to have both ears removed to stop the spread of any interior growth. He looked very strange at first, ferret like, not at all cat-like, my distaste was fuelled a bit more, but we got used to seeing him like that and I think he didn’t mind too much, at least he could still hear. He made another good recovery, he had my dutiful attention but my heart still wasn’t his. Another couple of years passed and Minou’s life was just like any other cat, he came in and out of the cat-flap as he pleased, even when it was locked, he simply kept bashing at it until it opened, he was determined to assert himself and indeed, it was clear that he was top cat over Geronimo and even poor Ruairi was intimidated at times by him, but he was resigned to his lack of control over whose neck he would dribble on. His last six months were a trial of mouth, teeth and gum infections. He became very poorly, couldn’t eat properly and lost a lot of weight. The melanoma had left its mark inside him. His immunity was low and his self-esteem probably just as bad. He was never a big cat but now he was hardly any cat at all, he was a baggy bundle of bony sick cat, confused and not doing a very good job of cleaning himself, but my heart melted when he blinked his eyes at me every morning, with such un-judgemental, un-conditional love, which only added to my guilt. His mouth infection cleared somewhat. With the help of antibiotics he was able to eat properly again but he wasn’t keeping any weight on. A tumour began to develop around his left eye and the day came when it was clear that his suffering should end. The vet said the tumour was a particularly nasty one and it would be kinder, he agreed, to let him go. I had already faced this prospect weeks before on a previous visit to the Vet. Minou in his cat box, on the front seat of my jeep was quietly blinking those eyes at me. It was like receiving a gentle embrace. I prayed to the greater being, to the universe, to God, and asked for the right decision for Minou. I wanted to give him this last chance, to stay or go, and I would accept the result with love and devotion, he gave a few little mews every now and then as if to reassure me. Minou had already had all the blood tests. The Vet prescribed more antibiotics and day after day, I cared for his poor little body, gave him his medicine, tried all kinds of food to build him up, but it really wasn’t working. He became lazy in his cleanliness and started to mess in the house and in all honesty, I was fed up with him, tired of the responsibility of looking after this troublesome cat. To acknowledge these feelings made me feel ashamed, it is something I have to live with, but when the end finally came, I held him in my arms as the last injection was administered, the last one Minou would ever have. The emotion that overwhelmed me was unexpected and completely draining. I think, in a way, I am still grieving, maybe not for the fact that Minou is gone, I am happy to know that he is free, but grieving for his sad life and my inability to love him properly. I hope I learned my lesson from Minou for I will always remember the soft embrace in his eyes that I was at last able to return unconditionally too.